Matt Hill is a portfolio manager at the University of Chicago Office of Investments. Previously, he was a portfolio analyst in both the public markets and private equity asset classes. Prior to that, he was a financial analyst at the University of Pittsburgh Medical Center. Hill holds an MBA from the University of Chicago Booth School of Business and a B.A. in applied economics and management from Cornell University. In this interview, Hill discusses how his diverse experiences shaped his investment philosophy, his framework for evaluating prospective managers and why he's an advocate of targeting and investing in early-life-cycle managers. Matt Hill was recently named on Trusted Insight’s Top 30 Endowment Rising Stars. He graciously spoke with us on May 2, 2017. Trusted Insight: You hold an MBA from the University of Chicago and now you're a portfolio manager at the endowment. What does it mean to support your alma mater? Matt Hill: It means a great deal and I owe a lot to the university. I've had the chance to work at the Investment Office for about five years now, and I pursued my MBA at the same time for the first couple of years, which has provided me with a fantastic education and work experience. The fact that I can, in some way, help to enrich a fantastic educational institution like the University of Chicago is very important to me. Trusted Insight: What does your typical day-to-day look like? Matt Hill: There is a lot of variability, so I'll try to speak in broad terms. Typically, I'm working on our pipeline and evaluating prospective managers, while also monitoring our current portfolio. My day typically contains internal meetings with our investment team and with the private equity team, as well as external meetings with peers and managers within our portfolio. Not every day is going to contain meetings. We also spend time doing a lot of proactive research on different areas of the market, managers or spaces that we find interesting. It also involves reaching out to other limited partners that we collaborate with and respect. We often exchange notes about what is interesting at any given point in time. Trusted Insight: What’s the investing process like at the endowment? How has your time in the private side helped inform your philosophy? Matt Hill: I’ve focused on private equity for the past couple of years, specifically what we call corporate finance or buyouts. I also spent time in the public market space. That’s where I started my career at the investment office. I was on the equity-oriented side of our public markets team. I think the ability to rotate, understand and get exposure to both public markets and private markets has been enormously valuable. When I first started at the Investment Office, I spent a lot of time reading commentary from managers in our portfolio. I also spent time reading pieces by, and about, investors like Warren Buffett, Ben Graham, Howard Marks, etc. So, from a learning standpoint, my time on the public markets team was valuable because it gave me a foundation for understanding philosophy, strategy, discipline and how managers evaluate securities. I've been able to take that foundation and apply some of it to the private side of the portfolio. Our team is very collaborative, because so many people in the investment office have worked in different asset classes during their careers. It makes discussions much deeper and more robust. I've had the opportunity to work with very smart, collaborative and high-quality people at Chicago. It's a fantastic group that I’ve been able to learn from at each step along the way. Trusted Insight: In regard to new opportunities, where do you look in the private market space? Matt Hill: We are looking a lot of places, but one of the areas where we've found compelling opportunities over the past several years is in the universe of managers early in their life cycle – managers raising their first or second institutional fund. Evaluating firms early in their life cycle can be time consuming. Typically, they have not previously spent time articulating their strategy, philosophy and competitive advantage to potential investors. The materials that you receive from these managers can, therefore, be more difficult to understand and piece together. Given that evaluating these managers is quite time consuming, why do we even spend time evaluating managers raising their first or second fund? Well, because we find that managers early in their life cycle often have attributes that are more difficult to find in managers later in their life cycle. These attributes, including modest fund size, fair terms and motivation to succeed, are tailwinds to a manager's ability to generate outstanding net returns. If those attributes come along with a team and strategy that you believe are capable of generating sustainably strong returns, you’ve found a pretty compelling opportunity. We think we’ve found some high-quality managers early in their life cycle that we hope to partner with for a long time. We think it’s been time well spent and will hopefully complement our more longstanding relationships in the portfolio. Trusted Insight: When you're faced with a lack of hard metrics that can prove their worth, what framework have you developed to evaluate managers? Matt Hill: It's multi-faceted. One of the elements is just trying to identify if there's tangible reasons why a manager's track record is sustainable. That often involves breaking down that track record very deeply, at the investment level and seeing if there's repeatability. What we're really looking for is, does the manager have a sustainable, competitive advantage to repeat this, and if so, why? Just having a number of good investments in the track record doesn't necessarily mean that we'll draw the conclusion that we can expect similar outcomes going forward. I'm always looking to dig into how and why that track record exists. Most of what we do process-wise is getting at the how and why. For example, for a manager in the buyout space, how do they generate their returns? Is it by organic cash flow growth over time, is it by paying down debt or refinancing over time? Is there multiple arbitrage, and if there is any or all of those elements, are they consistent and repeatable? Is it something they can do on a consistent basis in the future? Each manager is different and there are different characteristics that can generate compelling returns over time, but it's not a set checklist. It's really looking at each manager and saying "Okay, how and why did they generate this?" If a manager has an amazing track record, but we can't answer the how and why, then it's probably not an investment for us. Trusted Insight: What trends impact how you approach investments now? Are there any areas of uncertainty or areas you’d like to figure out? Matt Hill: I think one element of uncertainty is geography and sector concentration within the portfolio. We’re bottom-up manager selectors for the most part. Given that bottom-up manager selection focus, you may have several interesting managers that you're evaluating at a given point in time that are all focused on the same geographic region, or the same sector. How do you think about that? You don’t want to sacrifice conviction level to ensure geographic or sector balance in the portfolio, but there is likely to be tension between the two. Another area of uncertainty is the cycle. Valuations seem full and the amount of dry powder in private equity is high right now. In this environment, we’ve become even more focused on alignment of interests and the partnership aspect of an investment. We've evaluated several managers that we’ve found to be compelling from a team and strategy standpoint, but that we couldn’t get comfortable with from an alignment of interest standpoint. I think part of that has to do with the current market environment. Trusted Insight: If you had one lesson or piece of advice that you could give someone who's looking to transition into an asset allocator role, what advice would it be? Matt Hill: This isn’t groundbreaking, but one of the things that has been valuable to me is reading. There are so many sources of knowledge and insight out there now, whether it be through books, lectures, podcasts, etc. that great investors put out. I'm sure 20 or 30 years ago people that wanted to join the industry, get up to speed and really develop a personal philosophy, did not have access to the amount of information that’s out there today. You can read, listen, and learn from some of the great investors on your own. The learning curve is somewhat steep, but can be accelerated by all the sources of quality information and insight that exist today. Trusted Insight: What should we have asked about that we didn’t? Matt Hill: Good question. From an intellectual curiosity and acumen standpoint, the University of Chicago is made up of some really strong people that I've learned a lot from. I owe a ton to the people that I've gotten to work with over the past five years. I think that one of the great elements of this position is that you're not picking a single strategy to focus your entire investment career around. I think that’s very interesting and compelling in and of itself. Sitting in this position, I can see all different types of strategies, philosophies and investors from different parts of the world, all of which invest in different types of securities across the capital structure. There's constantly something new that I can learn, or a different kind of mental model that I can take from something and apply to something else, which again, points to how important and valuable I think it's been to work with so many good people at the University of Chicago. 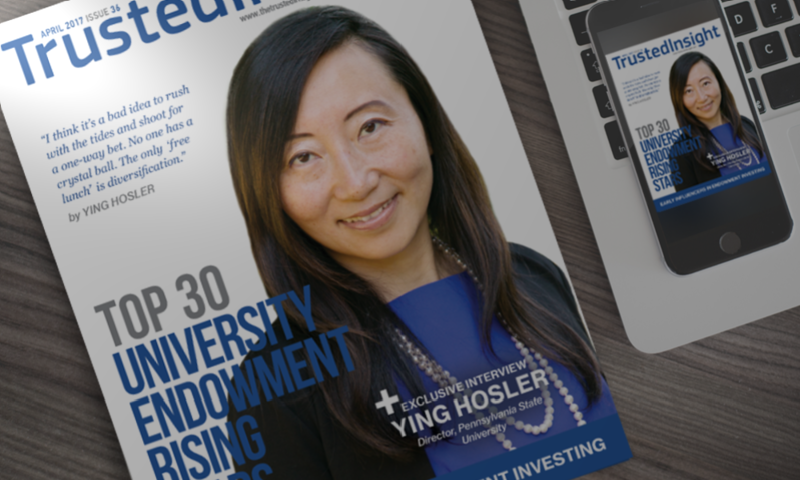 To learn more about endowment investing, view the complete list of Top 30 University Endowment Rising Stars. You can view our full catalogue of interviews with institutional investors here.